Show Off tag- Glamour is the key!! Show off Tag-You look like Lunch!! Show Off Tag- For the Racer in you! A NEW KIT FOR YOU ALL: Called HOT AS HELL!! Ziggy October Blog Train is here!!!! (little lesson on adding paper.. Copy the paper by hitting the ctrl and the layer as the same time. Paper 4 goes into the black squares. The ones in front of the back squares. Paper 2 goes into the Green Circle. This is where it might get confusing if it hasn't already..LOL. times. 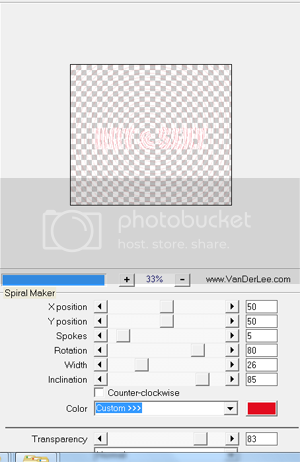 Go to filter-Vanderlee-spiral maker and then use these settings. Change the rotation every layer. CB3032. How you changed the color of the bigger letters, repeat that. Put the tube behind the letters. You should have this by now. around her head right below her neclace and hit copy and then paste. Copy and paste another part of the tube in the top part of the red circle and change it to screen. expand by 3. Add a new layer UNDER the red circle. Fill it with white. Duplicate it 2 more times. top layer, change to 84.
layer on the bottom of the front rectangle. Drop shadow using standard settings. Open up both flowers. resize them smaller and position them around the white border like I did. You can do anyway you like. I did two black ones..you can do that or two reds and black..etc. Add your mask, copyright and name. Now for the animation...If your using Photoshop CS5, you have the animation right on the bottom. I got bit by the Tutorial bug..Another Tutorial called Pinkalicious!! Open up the template and resize it so you can put your name...etc. Delete credits. 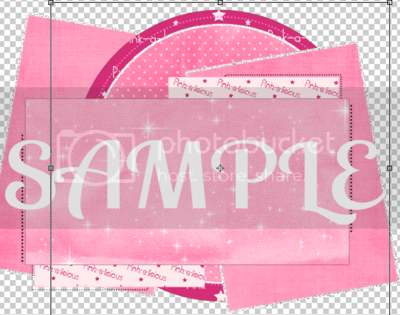 Open paper 8 and paste into Raster 20- the pink circle. Open paper 11 and put this paper in 18 and the copy of 18. (the back rectangle)We are going to put a border around them. Hit CTRL layer at the same time so you have a "dancing line" effect. Add another layer under the paper layer...Go to select-modify-expand and make selection 3 Hit OK. Set your foreground color to white flood fill. unselect the layer. Now for the tube. Re-size and center your tube in the middle. Take your rectangle marquee tool and copy and paste half of the tube. Copy and paste her in the front rectangle like this..
Gaussian Blur. Set the radius to around 6 pixels. Second layer leave normal. Top layer set to screen. Open Bows 2 and 4. Resize them and place them on top left corner and bottom right of the front rectangle. 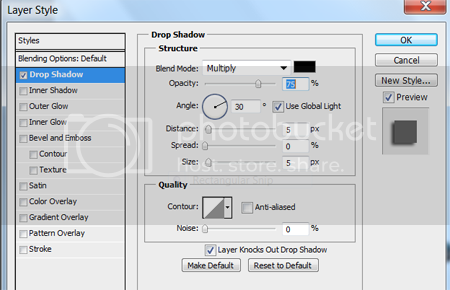 Merge and drop shadow using these settings..
Open ribbon eyelet. Place it where the black dots are on both sides. You can delete the dots if you want. Merge. Open up the diamond. Re-size it smaller and put it next to the upper bow. Duplicate and put another right next to it. Merge and repeat on the bottom. Open up ribbon. Resize it smaller and place it upper right corner of front rectangle. Open string and place it sideways behind bow by the back rectangle. Open up ribbon 4. Resize and flip it right above the right bigger rectangle. Open fluffy heart-resize and put it on the left side. Same with the butterfly. Drop shadow them both. Ribbon 2 is going behind the star string and tilt it a little so it's seen. to it. Merge and drop shadow. Open up splatter under all the layers. Duplicate it. Place one in the upper right and the other in the lower left. Add copyright info and name and tada..Your done!! Sorry if it was confusing but I'm just starting to write tutorials. Hope you enjoyed it. Also, Missy has great animations also so if you want to add one of them, that would be great too!!! This is my very first tutorial so if it's confusing, I apologize up front.LOL. Open up template- Crop it larger so you can add your name etc...You can resize it when your done. Delete credits and layers 10 and 12. Open up paper #1 and paste it into the purple rectangles. Merge. Paper #4 goes into the lighter Pink Circle. Paste and merge. Paper #8 goes into the bigger cirle. Paste and merge. Change the "Flirty Text" to white. Click ctrl and layer at the same time so the words are "dancing"
then take your paint brush size 50 switch your color to white and paint over. the left of circle. Repeat so you have another on the right. Merge them together and then duplicate. Now the fun part...putting the elements on. 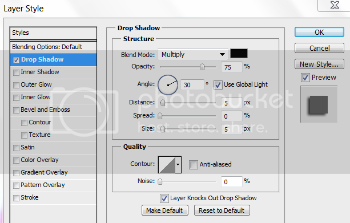 shadow with the same settings as before. Open up flower 1 resize to how you see fit and place it on the very top of the bigger rectangle. Open up flower 3 repeat and place it in the middle under the pink one. Open up flower 2 repeat as with the others and place it under blue one. Merge them and Drop Shadow. Open up ribbon 1 resize it and place it over big rectangle layer bottom left. Open up pink rose 1. Place it low to the right. Open blue rose put it right next to the pink one. Open bow 2. Resize it and flip it so bow is up and place it under the flowers. Drop shadow. Apply your mask under all the layers with paper # 2. Size it so it's kinda sticking out. and I would love to see if you tried it!!! Kit was a FTU kit called Racefan from Wicked Princess Scraps.. Thanks for the freebie! Template from Missy FTU Scrapkit My Jeans from Bea Creations... Thanks for your talent Ladies!!! Please leave some love when downloading it!!!!! Rose made a tag with one of my kits! It's awesome! Thanks sweetie!! 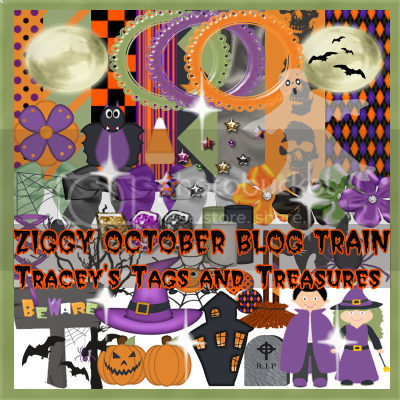 Hey all...This is Ziggy October Blog train...Here is my preview!! HERE IS THE REST OF THIS AWESOME TRAIN! !